Good question, very hard to answer. Every garden, every gardener and every job is slightly different and what works for one might not work for another. Tripod ladders are essential for large topiary and pruning jobs, hedges too. And they are ideal for orchard work, both for pruning and picking. For hedging, depending on the slope, you can either work face-on, with the 3rd leg poked into the hedge, or sideways, with the ladder parallel to the hedge. For tree work, the 3rd leg allows you to get right into the crown of the tree if needed. There are two different models: the original tripod ladder and the platform (or ‘crow’s nest’) model which has a deeper standing platform three steps from the top. The original model has steps straight to the top, one step per foot of height, with a deeper platform at the top that can be used to rest tools, picking baskets or other gear on. Model of choice for arborists, ideal for jobs where you need to work at different heights on the ladder and go up and down frequently. ANSI rated for commercial use, type 1A, 300 lb. 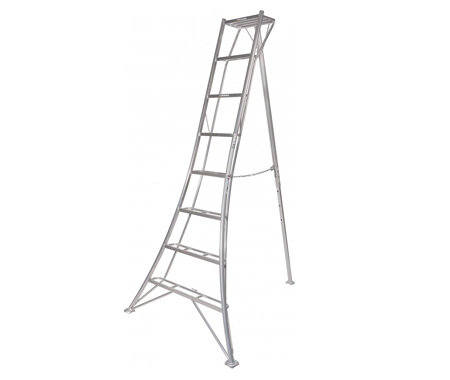 One step per foot of height, steps end at safe standing height (either 2 or 3 steps from the top, depending on size of ladder) – the last step is a deeper standing platform, and the upper portion of the ladder is a "crow’s nest" that you can lean into for added support and comfort. It also has an extra railing at the top. 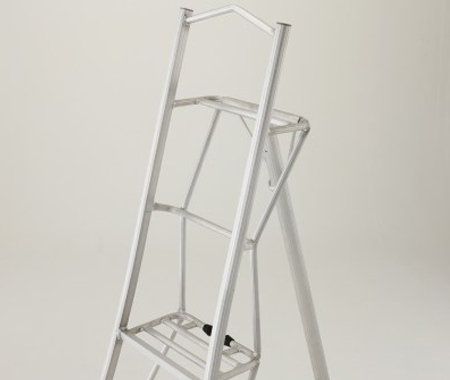 This model is ideal for jobs where you are standing on the ladder for long periods of time, and I often recommend it for people who aren't so comfortable on ladders. Or for companies that want to enforce safe standing height rules. Use the ‘Safe Standing Height’ (SSH) from this chart combined with your own height, and the height of the job (if you have something specific in mind), to fairly accurately say what size ladder you will need. The safe standing height is three steps from the top. Using the 8 footer as an example, your safe standing height is at 5′ (or the 5th step). Let’s say you’re 6′ tall, which means the top of your head is at 11′. If you are reaching to do pruning work you can reach to about 12′, arm outstretched. For hedge shearing, where ideally you want to be working between waist and chest height, you’ll have a working height of 8-10′. Of course it’s higher if you’re taller than 6′, and lower if you’re shorter. They’re all remarkably light, but they do get heavier as they get taller. 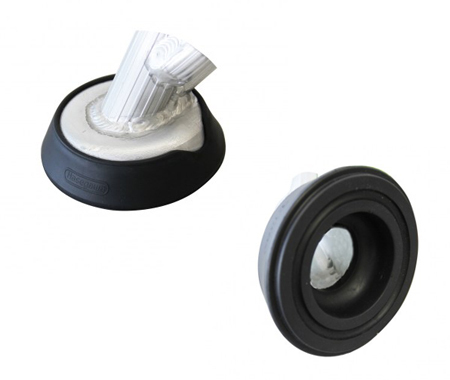 Weights and complete measurements are noted on the specifications chart for each model. And they are wide at the base. Moving them around in a confined space can be awkward and, depending on your height and strength, the taller ladders can feel top heavy and more difficult to carry.